Regrettably we do not have a Facebook account or a Twitter account. However, the City of Ottawa does have a twitter account and often release Public Service Announcements [sic] with regards to OC Transpo as we are a department of the city. The General Manager of OC, Alain Mercier, does intend to join the Twitterverse sometime next year. If there are any updates about OC Transpo - say a bus is cancelled or an accident is backing up traffic, it isn't enough for OC Transpo to throw an update on their website. I don't visit it at all for such updates, and I doubt many of you do either. Twitter, a service that lets you send a 140-character message to your followers, is really the perfect platform for Transit and commuters to communicate. It's instant, it's open, and best of all, it's easy to access and update on the go - especially while on a bus (or stuck waiting for one). Every day, there are a few dozen tweets from Ottawans about the bus service they love (or hate) so much. Is someone from OC Transpo reading them in any official capacity? Probably not. but that doesn't stop anyone from writing anyway, whether it's venting frustration (trust me, there is lots of that), sharing a great experience (it does happen on occasion), and everything in between. Despite a huge gap in any official OC Socializing, there are a number of resourceful and fun Twitterers out there fighting the good fight. These are run by people so passionate about commuting in Ottawa that they are using their own time and resources to reach out to us all. So who should anyone that commutes, with smartphone in hand, be checking out on Twitter? Note all of these (except the City of Ottawa account) are 100% unofficial and may may lead you astray. But they most probably won't. @OttawaCity: The official Ottawa Twitter account, Those PSAs mentioned above come through here. @OC_Transpo: This OC Transpo employee is stepping up by turning what his or her bosses won't do (until 2012) into an after hours gig. You'll find important OC-related updates, advice, and replies to some OC Tweets out there. It really is the closest thing to an 'official' Twitter. @OCTranspoBus: another Twitter feed, possibly maintained by another OC employee, that tweets updates with the service and asks for feedback. @OCTranspoAlerts: this automated feed gives trip detours and cancellations that are posted to OC Transpo's official website, as well as any other info that may affect your commute. @OCRidersAlerts: This Twitter account will automatically retweet anything with the #ocalert hashtag. Use it to find out from other transit users (or let other fellow commuters know) about any delays, detours, or cancellations. @PTIO: Public Transit in Ottawa is the Twitter account for http://www.transitottawa.ca. You'll find news stories and insightful commentary on transit issues in Ottawa. @OTTTransitGuy: As the force behind a couple of the the Twitter accounts on this list and a writer at http://www.transitottawa.ca, Wes is definitely someone to watch as he comments on and blogs about everything OC Transpo. @DianeDeans: She the city councillor for Gloucester-Southgate and the Chair of the city's transit commission. She's probably the most powerful person linked to OC Transpo that is on Twitter. @IHeartOCTranspo: that's me! Through the companion Twitter account for this blog, I'll tweet the occasional photo or comment, retweet quirky or positive OC Transpo tweets out there, and (naturally) link to this blog whenever there are new updates. I'd be remiss not to mention it. @IHateOCTranspo: Are you having a day because of OC Transpo? Ever wonder if anyone else is? IHateOCTranspo retweets all those OC horror stories, as well as the occasional love note for good measure. It's one of the funniest Twitter feeds out there and is a must read for commuters and non-commuters alike. 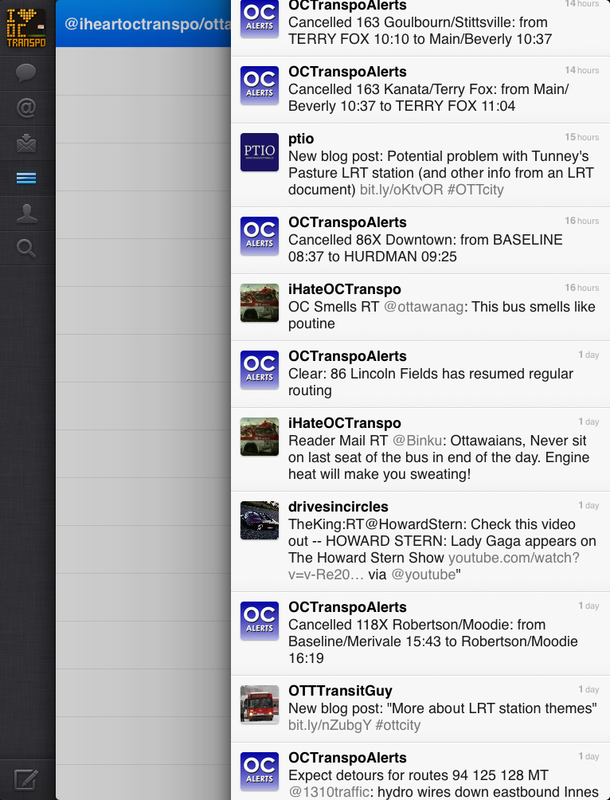 @OCTranspoLJ: this feed shares posts that people leave over at the OC Transpo community on LiveJournal. It's an interesting place where a few drivers give their perspective at things from OC Transpo. @DrivesInCircles: An OC Transpo operator who occasionally tweets and blogs about life behind the big wheel. @TranspoPics: This feed shares photos that people have taken (for personal use) on or about OC Transpo. @OttawaStart: while not necessarily OC Transpo-related, This account for OttawaStart.com is a must for anyone in Ottawa for all kinds of news, events, and quirky happenings in is small city of ours. A few do end up being OC-related. The Ottawa Start site also has a guide to OC Transpo! You can follow these Twitter accounts, and a few others, with my OC Transpo List. 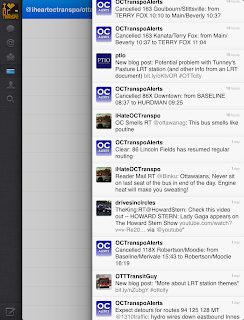 Do you have any OC Transpo - related Tweeters that you follow and should be added to the list? Let us know!